In a bowl take maida, sprinkle baking powder on it so as it mixs properly with maida. Now add sugar, cardamom powder & butter in it.knead it & make a fine dough without adding water or milk, it may quite difficult to make, but for soften result its necessary. Once done add 2-3 tsp of milk & again knead it. now it is ready for baking. Make 10-12 small balls of the dough. take one on palm, press it gently, stick 2-3 almond slices, few chironji & keep it on the greased baking tray.do same for all balls. 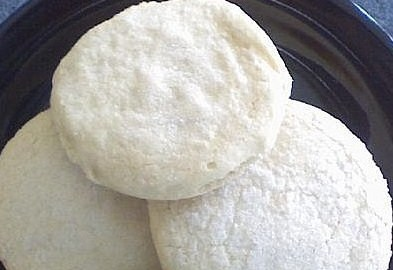 Keep only 4-5 naankhatai at a time in a baking tray & bake it in oven for 15 min. Oven settings are gas mark 2, having 150 °C temperature. If it cooked properly it becomes so soft, melt immediately in mouth when eat. Doesnt the khatai contain semolina "suji"?